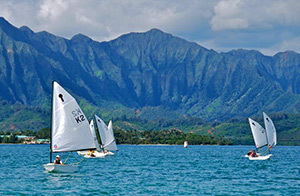 You must hold a license with the Kaneohe MCB Marina to rent and operate any of our boats. To obtain a license for renting the 10 & 12-person pontoon, 6-person boston whaler or ski boat, you must complete the online class(es) by clicking the button on the bottom. You can obtain a sailboat license by taking our sailing test and prove proficiency in rigging our non-keel boats. By passing the test, and proving proficiency you will be issued a license. Follow the link below to be taken to the sailing page for information on boats, procedures and fees. NOTE: The entire process takes about 30 minutes to complete. Please be sure you have set aside enough time to complete this before you start. Click HERE for step-by-step instructions on how to obtain a license and make a reservation. Follow this link to go to the SAILING PAGE to get more information for the sailing licensing. After completing your test, you will need to schedule a bay check (ride around the bay). The bay check is for the licensee only, passengers are not allowed. Below is a listing of bay check days. If you are taking the sailing exam, you will be given more information upon completing the test. Click here for the Buoy Map of Kaneohe Bay. Licenses are good for one year and are $25. This must be paid prior to your bay check. Patrons must check in 30 minutes prior to the bay check ride to allow time for payment. You will need to schedule your bay check online after your test.